PHUKET: Phuket Customs officials have seized 47,000 liters of smuggled diesel hidden on board two Taiwanese boats off the east coast of Phuket Sunday. Officials estimated the total value of the smuggled diesel seized at 21 million baht. 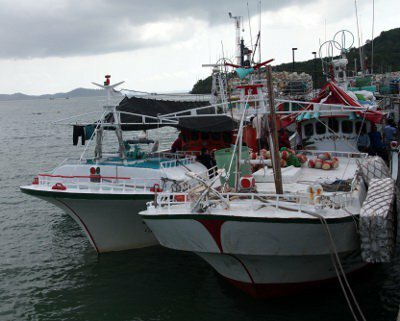 The two boats, the ChingChunFa 168 and the Chi Tsai 16, were seized one to two nautical miles north of Taphao Yai Island, on Sunday, said Rakop Srisupa-at, director of the Royal Thai Customs Investigations and Suppression Bureau, who was in Phuket to announce the haul yesterday. He explained that the raid on Sunday followed his office receiving a tip-off that fishing boats near Phuket were selling smuggled diesel. “There are about 100 legally registered tuna long-line fishing boats operating in Thai territorial waters off the Andaman coast. “We learned that several boats in the area had been modified to smuggle diesel. It was very difficult to spot these two boats in particular, since they look like regular fishing boats with all the necessary fishing equipment,” he said. Arrested in the raid were the Ching ChunFa 168 captain Wang Yap Yu and his three Indonesian crew members, as well as the Chi Tsai 16 captain Huang Chiang-Hsieh and his three Taiwanese crew and four Indonesian crewmen. “Phuket Customs officials have taken them into custody and they will be prosecuted,” Mr Rakop said. The raid was part of an ongoing anti-smuggling crackdown ordered by Thai Customs Director General Somchai Poolsavadi, Mr Rakop explained. However, the number of smugglers selling illegally imported diesel is on the decline, he added. “There are not many cases of diesel smuggling along the Andaman coast. I think it’s because there’s not much of a difference in the price of the illegal diesel when compared with the normal price, which is why no one wants to take the chance,” Mr Rakop said.